Bye bye Marat, it was a brilliant comeback from two sets down but he finally lost it 10-8 in the fifth. We’re now officially boycotting the wildcard that beat him. Time to hop on that Sharapova bandwagon instead. 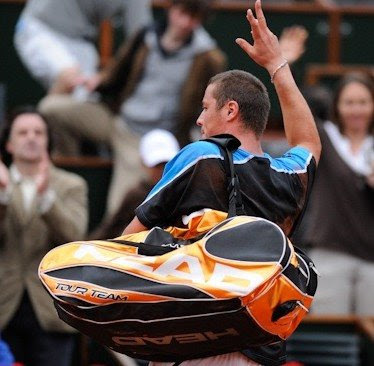 Larcher de Brito upset Zheng – is Zheng losing on clay an upset? – and continues her march towards greatness. Hope she pays careful attention to careers of recent teen prodigies Vaidisova and Karatantcheva. Gulbis is out as is Lopez, Youzhny, Rus, Vesnina and Tanasugarn. Grats to Benesova, Li Na, Cibulkova, Ivanovic, Pavlyuchenkova, Tipsarevic, Nadal, Hewitt, Gonzo, Cilic and the Worm. Clement vs Rochus – revenge for Santoro? Del Potro vs Troicki – dangerous for Del Potro? Jankovic vs Rybarikova - beauty and the beast pusher?